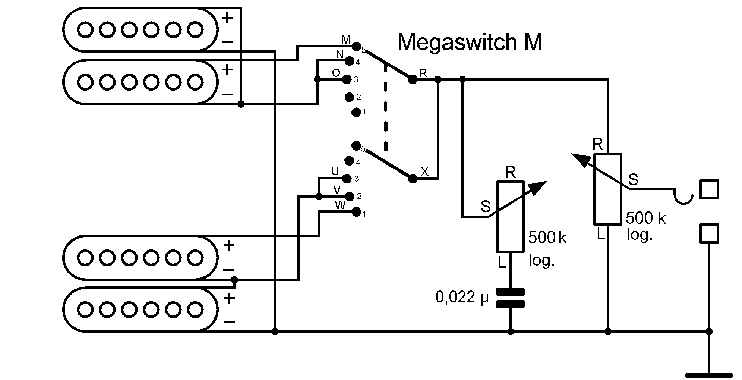 In guitars with 2 Humbuckers, this is the simplest standard switching. 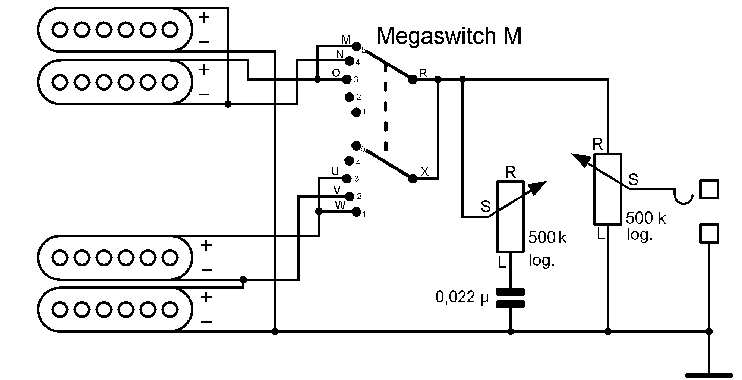 The switches have 3 positions and control the bridge both parallel and the neck. Each one has its own tone control. 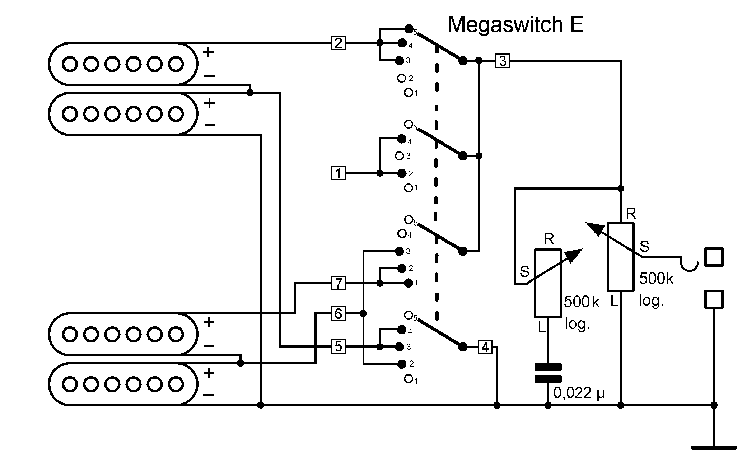 The ideal switch for this application is the Megaswitch T.
With this version, both Humbuckers are switched in series in the middle position. 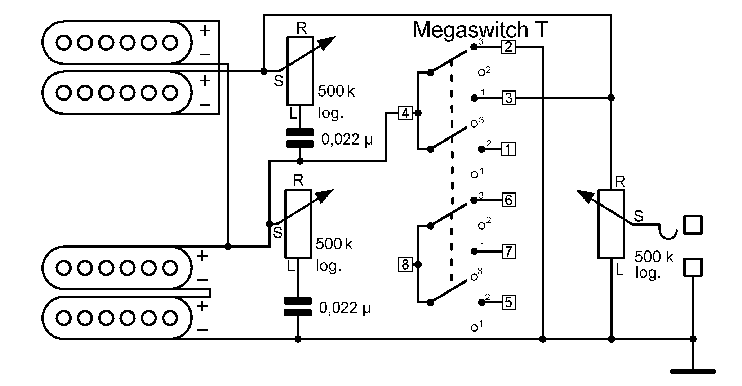 Compared to parallel switching, this results in a louder, fuller tone. In both outer positions, one or the other of the pickups is deactivated . 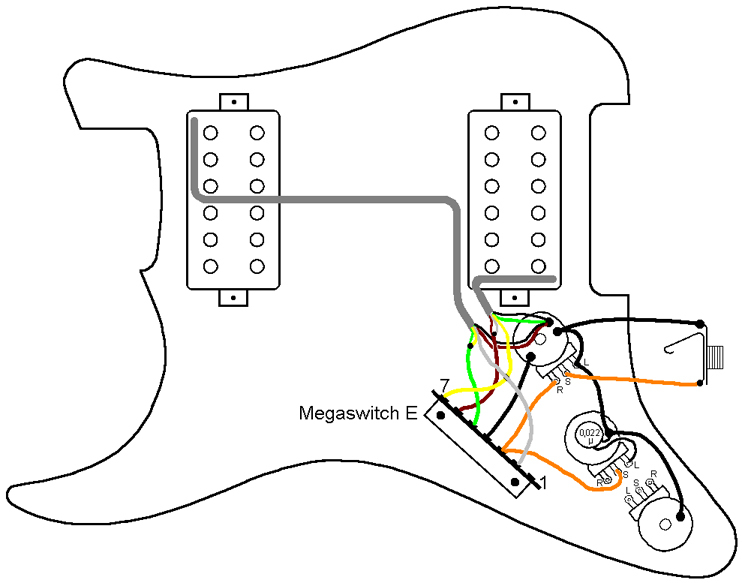 Here, on the neck Humbucker, all coil connections must be disconnected from the earth/ground. In the middle switch position, both Humbuckers are in series. Compared to parallel switching, this creates a louder, fuller tone. In both outer positions, one or the other pickup is deactivated. 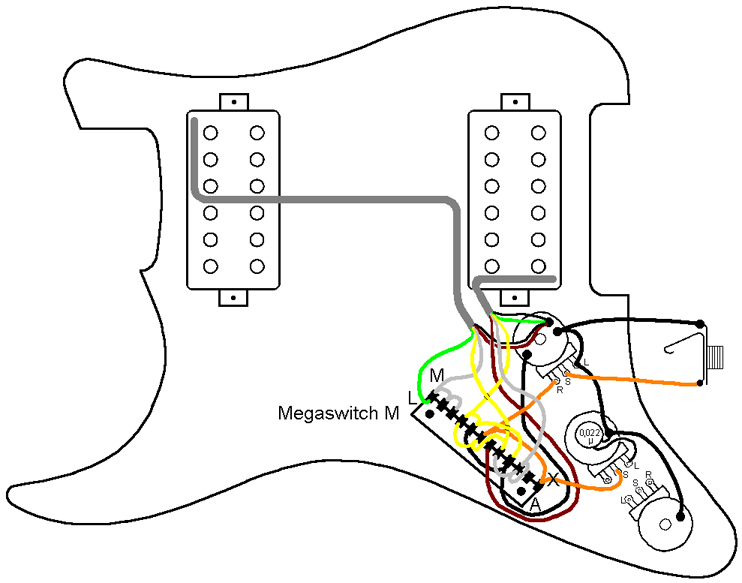 Here, all coil connections on the neck Humbucker must be disconnected from the earth/ground. This means that Humbucker types with single-core insulated cables are unsuitable. If the high frequencies are to be reduced in the middle position, both tone control knobs should be used to achieve this. Megaswitch T is the ideal choice in this case. With this version, the middle switch position splits both Humbuckers, although the remaining coils (here the outer ones) are switched in series. Both inner coils are deactivated. This creates a brighter sound compared to coils in series which are not split. It is also possible to activate both inner coils or additionally, an outer and an inner one. In this case, both coils on the Humbucker must be reversed. The middle switch position is buzz-free when a north pole and a south pole coil operate simultaneously. For this switching position, just a single tone control is advisable. 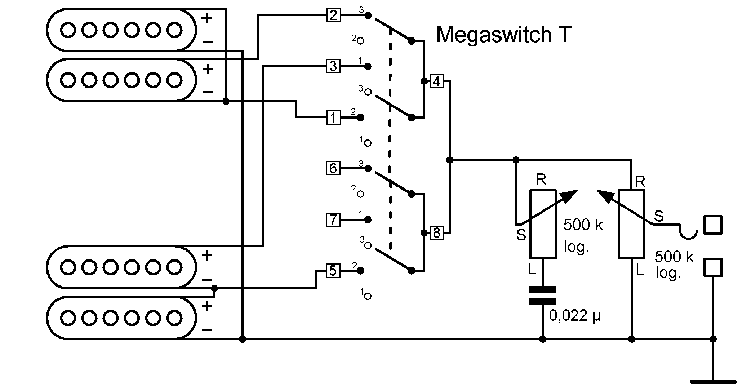 The Megaswitch T is the ideal switch for this application. In this version, the middle switching position splits both Humbuckers and the remaining coils (the outer ones in this case) are switched in series. The two inner coils remain open. Compared to non-split parallel switching, this creates a brighter sound. It is also possible to leave both inner coils, and additionally, an outer one in operating mode. To achieve this, the coils of both Humbuckers must be reversed accordingly. The middle switching position is buzz-free, when a north pole and a south pole coil are in operating mode. 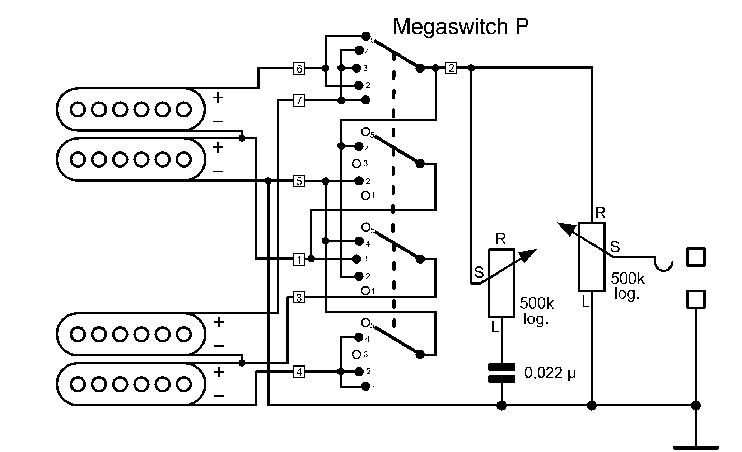 In this switching version, just a single tone control is advisable. The Megaswitch T is ideal for this purpose. 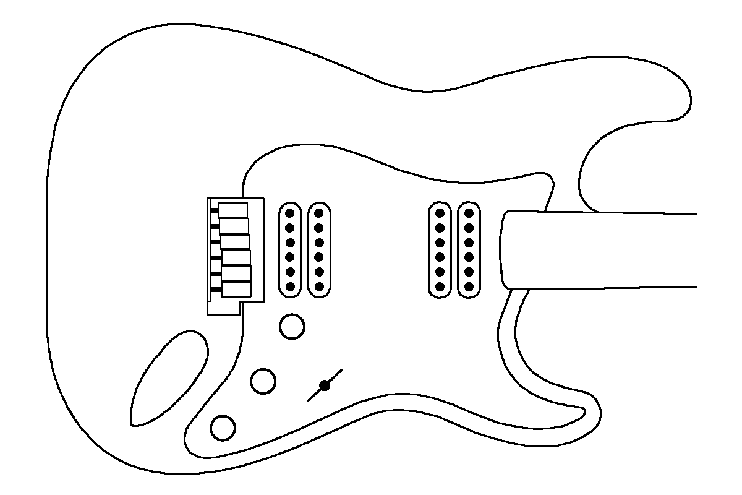 Here, the Humbuckers are split in position 2 and 4, although the outer coils remain in active mode. 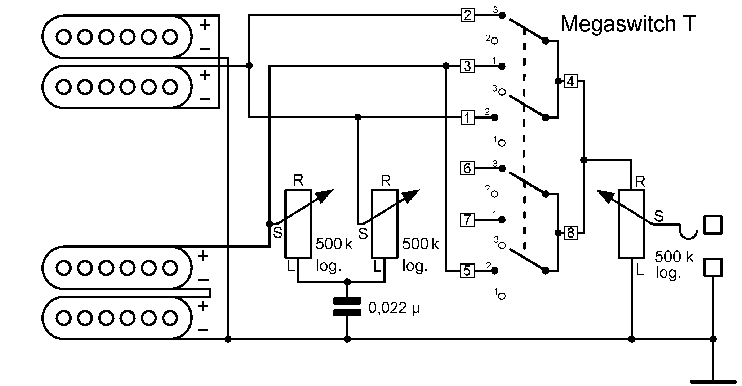 By reversing the coil connections, it is also equally possible to configure both inner coils, or one inner and one outer coil in active mode. A buzz-free sound can be obtained by making a north pole and a South Pole coil work together. The Megaswitch M is ideal for this purpose. This is a variation on the HH5. Here, both Humbuckers are split in position 3. The sound is brighter as a result. 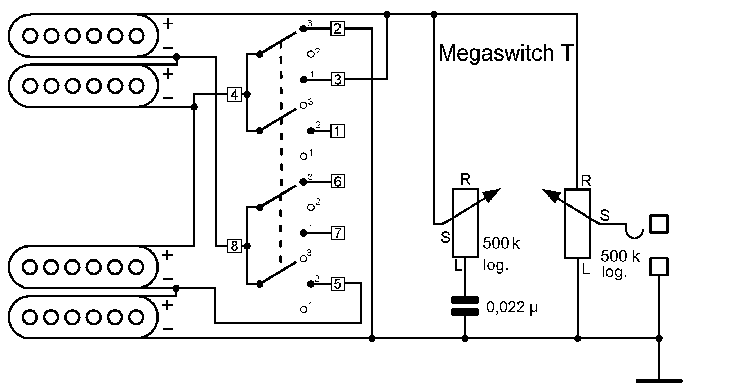 By reversing the coil connections, it is equally possible to make both inner coils or an inner coil and an outer one to remain in operating mode. A buzz-free sound can be obtained when a north pole coil and a south pole coil remain active. The Megaswitch M is ideal for this purpose. 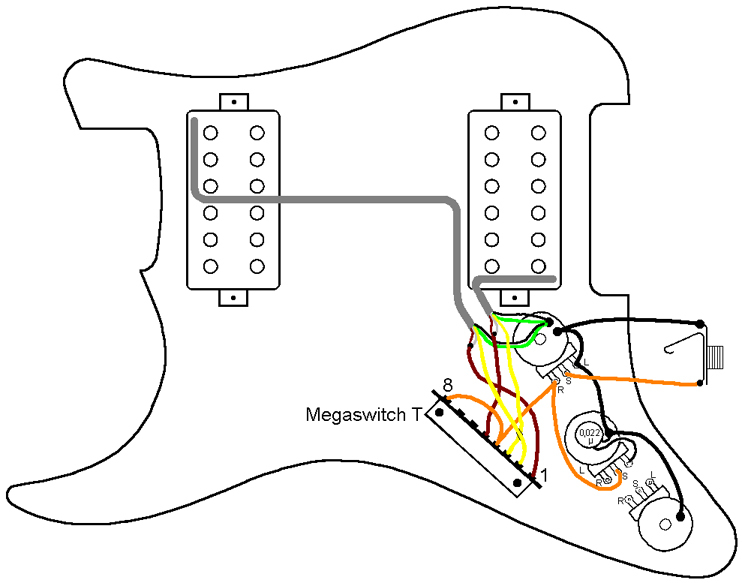 The HH7 is quite similar to the HH6, except that it features the Megaswitch E. Here too, by reversing the coil connections, a different coil can be made to remain active when the Humbucker is split. For a buzz-free sound, one north pole coil and one south pole coil must be in operating mode. Here, the coils of the Humbucker are switched parallel in positions 2 and 4. All positions are buzz-free. The Megaswitch M is ideal for this purpose. 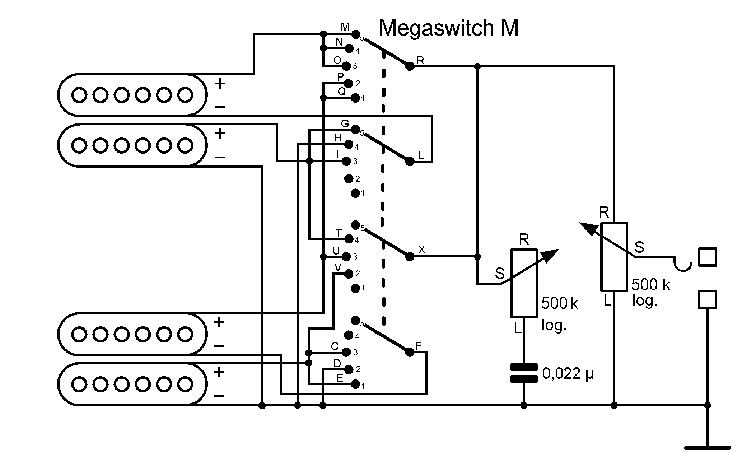 The Megaswitch P was specially developed for this purpose. Whereby all positions are meant to be buzz-free, the magnetic polarity of the coils must be NS-NS or SN-SN. This is the case on PRS guitars; here the neck and bridge pickups are poled differently from a magnetic perspective. 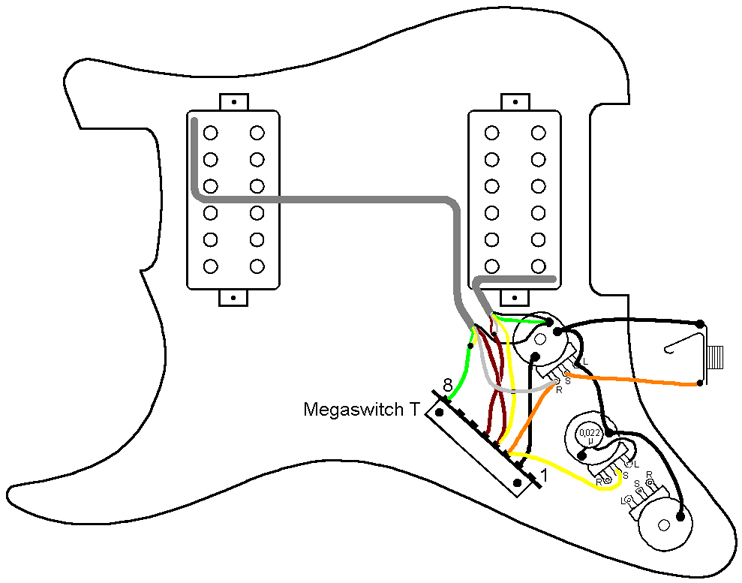 In the event that in standard types the screw side should be the outer one and that buzz-free sound is required in all positions, the magnet in one of the two pickups must be turned.